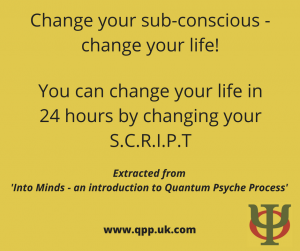 Are you ready to change your life but still held back by your old subconscious beliefs? Have you had enough of your negative thoughts and feelings, low self-esteem, self-sabotaging behaviours, insomnia, and difficult relationships? 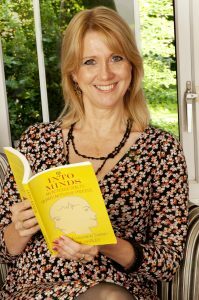 There's now an easy and effective way to change the unhelpful subconscious beliefs that have been keeping you stuck, and to free yourself up to have the life you want - without wasting money on months or years of counselling! I have created a unique 12 step method called QPP - which safely changes your subconscious beliefs for the better! ​Aren't you fed up with living like this - and desperately want things to change for the better? Think of the benefits of having your subconscious mind working FOR you instead of against you! You deserve to feel happier and calmer, more balanced, in control of your life, able to think and express yourself more clearly, enjoy better sleep - and not be dependent upon food, alcohol, drugs or other 'distractions' to temporarily make you forget or feel a bit better about yourself and your life. QPP can bring great improvements to your life because it reveals, reviews and revises your Sub-Conscious Belief System - which is responsible for your perceptions, automatic thoughts, self-talk, emotional reactions, self-concept and behaviour – and even for your overall health and well-being! 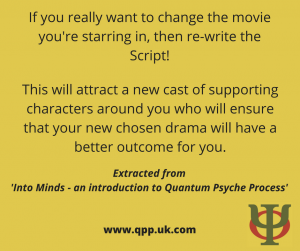 QUANTUM PSYCHE PROCESS is a very affordable and effective way to change your whole life! QPP is now available as an online self-help 12 step programme - it has 12 brief 'modules' which you will access online. These guide you step by step from the initial preparation for QPP, to the actual session you will carry out by yourself, and the follow up 'audio homework' that you will be listening to - which re-inforces the changes made in your QPP session. 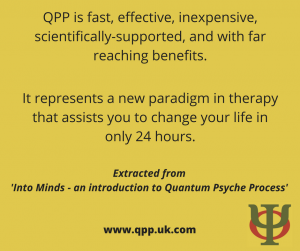 QPP is an unique method which combines scientifically validated aspects of Neuroscience (neurogenesis and neuroplasicity - the ability of the brain to rewire itself), Quantum Science (the new template for an improved life), Brainwave Entrainment (to bring your brain into the receptive state for reprogramming) and Energy Psychology (to make the changes become holistic and life-long). QPP differs from other methods because it is tailored to suit your own personal and specific needs - and includes using your own voice to reprogramme your mind...the voice of your inner self talk! Think of the time and money you'll save from not having months or years of counselling therapy or coaching - which can't change your deep subconscious beliefs anyway! QPP will only work for you if you put in a bit of effort and complete the whole process in the right order. As long as you know how to 'download' an app to your smart 'phone, or software to your computer (and that only takes a click! ), then you will be able to prepare yourself for QPP and the changes it will bring to your life. You will get out far more than you put in! A better experience of life HAS to be worth a few hours of your time! You can find out more about QPP from the 'About' and 'Q&A' pages on this website, and read some of the many positive testimonials on the 'Testimonials' page. In accordance with the GDPR regulations of May 25th 2018 I need to inform you that any personal information you share with me – e.g. your name and e-mail address necessary for downloading digital products from my website – will be kept safe and private, and will not be shared with anyone else or used for unsolicited marketing purposes. You will find that I send you just a few relevant and helpful e-mails that accompany your purchase of access to the QPP self-help method – and you can unsubscribe from these at any time. The date storage facility and payment portals are owned by large companies which have their own robust privacy policies in place. Likewise my assistant is also bound by these data protection regulations to respect the safety and privacy of any personal date collected from my customers.